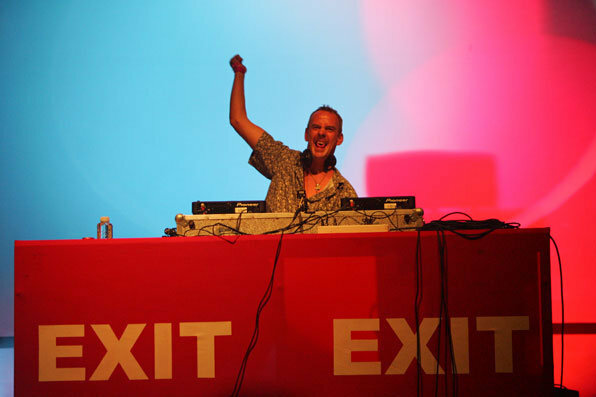 You may know him as Norman Cook, but very likely that Fatboy Slim is more familiar. Although he is a solo artist, somehow his name ended up on a Q magazine’s list “50 Bands to See Before You Die”. He performed at Exit Music Festival six years ago, and since then he played at all four corners of the world, and everywhere in between. If you missed your chance then, don’t worry because this September Fatboy Slim is coming to Belgrade. In a exclusive interview for our magazine he promised fantastic show in Belgrade Arena on 23rd of September. FS: Noorman, above all, thank you for your time to do an interview with us. the end of a summer season? FS: But you have energy for one more right? N: Well, not for only one, first I have Bestival – Isle Of Wight, closing party at Amnesia – Ibiza, and then Belgrade will be the pretty much the end of a season for me, the big finale! FS: You said once that the Fatboy Slim is an oxymoron, that actually it cannot exist, but we can hardly imagine electro and dance scene as it is today without Fatboy Slim? N: Yeah, the word Fatboy Slim is an oxymoron. People ask “Why you are calling yourself Fatboy Slim, you are not fat or slim.” But that’s the name in a music business by what, especially younger people, know what I do. FS: ‘Praise You’ has been voted as the number 6th top floorfiller of all time! Is that your favorite tune too? N: It’s hard to answer favorites of your own tunes, the others should speak about that. FS: You bring smile to people’s faces, is that where your logo came from? N: Actually it came from a tattoo, I’ve got a tattoo like that. It represents acid house as well. FS: People love the way you interact with them during the party when you write all those messages on you records, I have a feeling that you have more fun than the crowd? N: You have to be having more of the party then the rest of a crowd, you have to lead by example. But I quit drinking two and a half years ago, so I take it a little more bit seriously. FS: You’ve opened a store on your website recently, what’s about with “It Ain’t Over Till The Fatboy Sings” Tee Shirts? Are you gonna sing in Belgrade maybe? N: No, I won’t. It’s just an expression in England “It Ain’t Over Untill The Fatlady Sings”, you don’t want to hear my singing, believe me. Actually you can hear my singing, I did a video with a cam on a strap, the camera was stuck to my head, one thing that I didn’t realize that it had a microphone on it, so I am actually singing louder then the records. FS: Although you have an album called “I’m #1 so why try harder”, can we expect a new album soon? N: No, certainly not. I’m having so much fun doing these parties and don’t have time for that. I have a feeling that you should make a records when you have something to say, and I’m really enjoying travel around the world, turning people on to the new records, and having fun and making people dance. FS: Do you prepare the Big Beach Boutique 5 soon? N: Yes, it may come pretty soon actually. It will be in Brighton, but it may not be on a beach though. Unlike the previous one, it will not be “for Brighton residents only”, so everybody can come. FS: You have already played in Serbia at Exit Music Festival. What are your impressions? N: Well, the impression I made at Exit Festival few years ago is that I still have people coming after me saying “Oh, I saw you at Exit! It was awesome!”. I am really excited to be back, and like I said, the show is bigger and better, so we all gonna have fun! FS: Will this party be broadcasted live on Be-At-TV maybe? N: Possibly, the thing is you never know where Be-At-TV will gonna turn up next. They never tell you when they are coming, you find out that day, we gonna wait and see. FS: When we are speaking about stage performance, are you gonna have a special attire for the party in Belgrade, or it will be one of those shirts with a lot of smiley faces on it? N: Probably something that will have smiley faces. I also have a new logo that is more like a tattoo, so hopefully we will bring some of that too. FS: And a cliché for the end, do you have a message for your fans in Serbia? N: Sorry guys that it takes me so long to come since Exit, but I’ll be back bigger and better. See you in Belgrade!